AZDPS enforces state narcotic laws by conducting complex investigations of groups and individuals, who use, manufacture, sell or distribute controlled substances, and prescription-only drugs. Special units are also assigned to investigate and process methamphetamine labs. AZDPS also provides narcotics enforcement services statewide by participating in numerous multi-agency task forces that include federal, state, and local law enforcement agencies and prosecutors. Assistance is also provided by the department to other agencies who have case specific needs pertaining to narcotics investigations. Furthermore, community outreach programs are conducted by the department to educate the public about the dangers of narcotics, and provide instructions to the public on how to identify and report suspected narcotics related activity. Not counting the more than 9,000 pounds of illegal drugs seized by AZDPS troopers on state highways in FY2016, the department seized more than 28,900 pounds of illegal drugs through its investigative functions in FY2016. This represents a 19 percent increase from the amount of drugs seized by AZDPS investigative functions in FY2015. Shown below is a breakdown of the amounts and types of drugs seized by the department’s investigative functions in FY2016 in comparison to the previous four fiscal years. With the exception of marijuana plants and currency, all of the amounts are listed in pounds seized. The numerous investigations and activities that led to these seizures also resulted in the apprehension and arrest of numerous suspects on drug-related charges. Shown below are statistics that detail the number and type of drug-related arrests made by the department’s investigative functions in FY2016 in comparison to FY2015. Complex investigations were responsible for a significant portion of the drug-related arrests and seizures made by AZDPS in FY2016. One of those investigations was a multi-month probe into a drug trafficking organization that was responsible for the cultivation, possession, and nationwide distribution of marijuana from an area in northern Arizona. The investigation culminated in the service of four search warrants in northern Arizona, including one in Flagstaff on an illegal marijuana cultivation operation. That search warrant yielded 360 marijuana plants, $100,000 worth of grow equipment and the arrest of one suspect. Investigative efforts pursuant to that search warrant led investigators to identify a larger drug trafficking organization operating in another area of northern Arizona. Three search warrants were served in and around the Arizona towns of Happy Jack, Ash Fork, and Seligman. In total, an additional 180 marijuana plants, sophisticated marijuana growing equipment, real property, and weapons were seized during these search warrants. A total of seven suspects were ultimately indicted. The three illegal marijuana grow operations and the drug trafficking organization were dismantled as a result of the investigation. Marijuana sales and distribution associated with this drug trafficking organization had links in Arizona, California, and the East Coast. Another complex narcotics investigation in FY2016 began when troopers stopped a vehicle for a traffic violation which ultimately led to the discovery of five pounds of marijuana and over $3,000 in cash. Investigators with the department turned that small seizure into something much bigger when they developed information revealing the driver of the vehicle had a functioning drug lab inside of his residence. 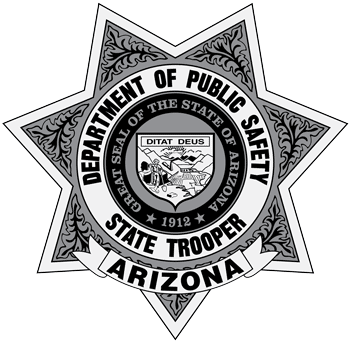 After obtaining a search warrant, a team made up of AZDPS criminalists, detectives, and troopers served a search warrant on the driver’s residence in Payson. In addition, personnel from the department’s Crime Scene Response (CSR) team, Hazardous Materials (HAZMAT) team, and Explosives Ordnance Disposal (EOD) team were present to help dismantle what was a large hash oil lab. Notable items seized during the search warrant included 34 rearms, 19 pounds of marijuana wax, $5,025 in cash, 130 additional pounds of marijuana, one gram of cocaine, and two quarts of hash oil. Also seized was 18.5 gallons of a precursor chemical mixed and ready to make hash oil, 70 gallons of ethanol, 2.5 gallons of isopropyl alcohol, and extensive glassware and lab equipment. The Arizona Department of Environmental Quality assisted with disposal of the chemicals. It is estimated that the street value of the marijuana wax seized is over $500,000. A final example of a complex investigation conducted by the department in FY2016 involved a drug trafficking organization based in Mexico. Investigators with the department initiated a case closure in support of the six-month investigation. The drug trafficking organization at the center of the investigation was utilizing multiple cell phones and cell phone applications in an attempt to avoid detection from law enforcement. At the end of the investigation, search warrants were served on five residences, two vehicles and one storage locker. Among the items seized during the search warrants were $63,948 in U.S. currency, 552 pounds of marijuana, one gram of cocaine, two AR-15 riffles, four handguns, and 380 rounds of ammunition. Additionally, three residences, two sport utility vehicles, and a motor home were seized for asset forfeiture. Five suspects were arrested on charges related to marijuana sales, money laundering, fraudulent schemes, forgery, and weapons violations.